PGP stands for Pretty Good Privacy. It’s an encryption program that’s mainly used for email encryption, but it can be used for encrypting any sort of data. Before you read this tutorial, please note one thing: PGP provides privacy, not anonymity. It will not hide your name — quite the opposite: it will attach your name and email to any message you sign, and your recipient’s name and email to any message you encrypt. PGP is the program that was initially released in 1991 by Phil Zimmermann. OpenPGP is the standard (anyone can create their own encryption program that follows this standard). There are many programs following the standard, most commonly used one being GPG (GNU Privacy Guard; tutorial). Note: PGP usually refers to the standard — OpenPGP, not the program. PGP utilizes public key cryptography, so both the sender and the receiver have their public and private keys. Public keys are public because you can distribute them freely without hurting the security of your keys. Private keys are private because you should protect them very well. PGP encrypts your private key with a passphrase, so if it accidentally gets leaked, your communications aren’t necessarily compromised, but it’s still a good idea to generate a new key pair in case of a leak. It’s also important to differentiate between encryption and authentication. This is why PGP supports signing as well. Your private key may be secure, but your email is not. Attackers can try to make it look like an email came from you, or even send it from your address — someone can* access your computer, your email provider can send emails from your address extremely easily, etc. And because public keys are usually publicly available, without authentication it’s extremely easy to supply someone with fake information. Bob receives an encrypted email from alice@example.com. The email came from Alice’s email address, should Bob trust it? No. It needs to be signed (see below) by Alice. * this obviously depends on how secure your computer is — e.g. if you use full-disk encryption, an email client that remembers your password, etc. Alice wants to send an encrypted email to Bob. She downloads his public key and verifies it (verification is explained further in the tutorial). 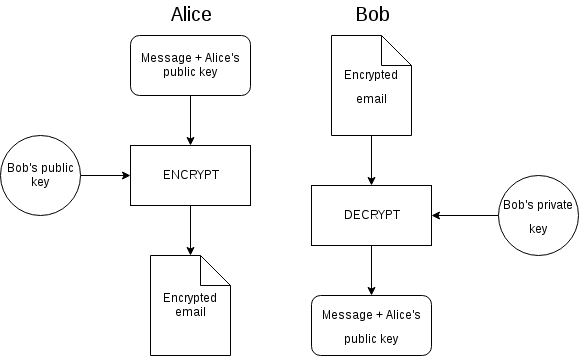 Then she encrypts the message and her public key with Bob’s public key and sends it to Bob (she needs to send Bob her public key as well, but simply attaching it in plaintext to the email is a bad idea, as an attacker can replace it, thus give Bob the wrong key — the attacker’s key — and decrypt Bob’s subsequent reply). The attachment is separate from the email body — it’s is not encrypted, so replacing it is extremely simple. But Alice can send her public key to Bob in the email’s body, as well as in attachment — the important thing is that it’s encrypted, right? Actually, no. Since the message is not signed by Alice, she shouldn’t send her public key in attachment, encrypted or not. Eve (an adversary) could encrypt her public key with Bob’s public key and replace the attachment. Also note that this is an example of an initial contact between Alice and Bob. Otherwise Alice would have no need to send her public key to Bob. 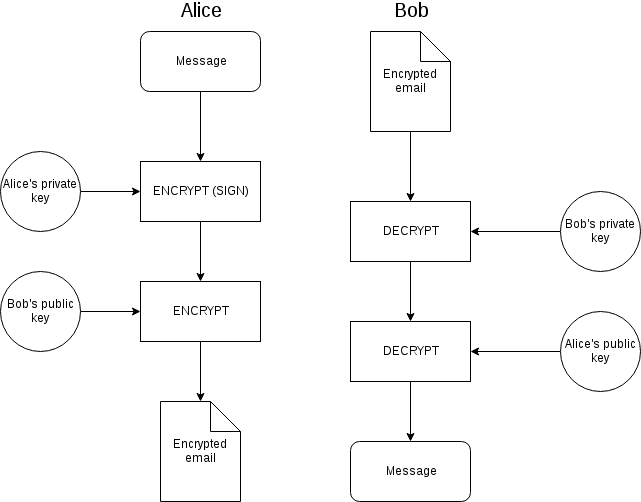 Same as the previous example, but before encrypting the message with Bob’s public key, Alice encrypts it with her private key. This process is called signing. This is the right way to use PGP. How does it work? After Bob decrypts Alice’s email with his private key, he gets the message encrypted with Alice’s private key. In public key cryptography, the public and private keys are a pair of keys — a keypair. What’s encrypted with the public key can be decrypted with the private key, and what’s encrypted with the private key can be decrypted with the public key. Decrypting a signed message with the sender’s public key decrypts the message to its unsigned (plaintext) version. A keypair consists of two keys: the public key and the private key. Each key can decrypt a message encrypted with the other key. Just like a message encrypted with one’s private key can be decrypted with his public key, a message encrypted with one’s public key can be decrypted with his private key. Since the email body is signed (encrypted) with the sender’s private key and the receiver doesn’t know the sender’s public key, it needs to be sent separately, outside the email body — in attachment. How do keys and encrypted data look like? Notice the PGP PUBLIC KEY BLOCK — this is a public key. A private key would have PGP PRIVATE KEY BLOCK instead of that. An encrypted file/message would have PGP MESSAGE. Note that this near-human-readable output is present when using the ASCII mode (ASCII means American Standard Code for Information Interchange, which basically means that it will only contain letters you’d find on an American keyboard). The non-ASCII mode would be just a bunch of random-looking bytes, so most of it couldn’t be even displayed. Once you generate your keypair, you should generate a revocation certificate as well. In case your private key gets leaked you just upload the revocation certificate to a keyserver and it will show that the key has been revoked next to the key info. Generating a revocation certificate is highly recommended! Will take nearly no time and effort, but can be critically important in future. It’s a lifesaver. Expiration date is another fundamental concept. As you probably guessed, it specifies on what date should the key be marked as expired. Why is it important? If someone obtains your private key as well as the password to it, they can read any data encrypted with it (and encrypt and sign data as well!). Generating a new key ensures anyone with your old key won’t be able to read your communications anymore. Also, let me reiterate: if your key gets stolen and you know about it, revoke it! Note that this depends very much on your threat model. I, for example, use one with no expiration for admin@theprivacyguide.org. If you’re considering leaking thousands of documents from a government agency, you might want to use something more like a month. Know that using very-short-term keys for a “Contact Me!” will just get people annoyed. When they want to contact you again, that is, as they won’t care about the expiration of a key they used to send a single email. How to distribute public keys, though? Well, that’s what keyservers are for. Anyone can upload public keys to them. Their key functionality is synchronizing — uploading your public key to only one is enough, it’ll share it with all the other keyservers. One of the most commonly used ones is the MIT keyserver. Note that anyone can generate (and distribute) keys for any name and email address, so grabbing the first key you see is not a good idea. This issue is discussed in the following section. 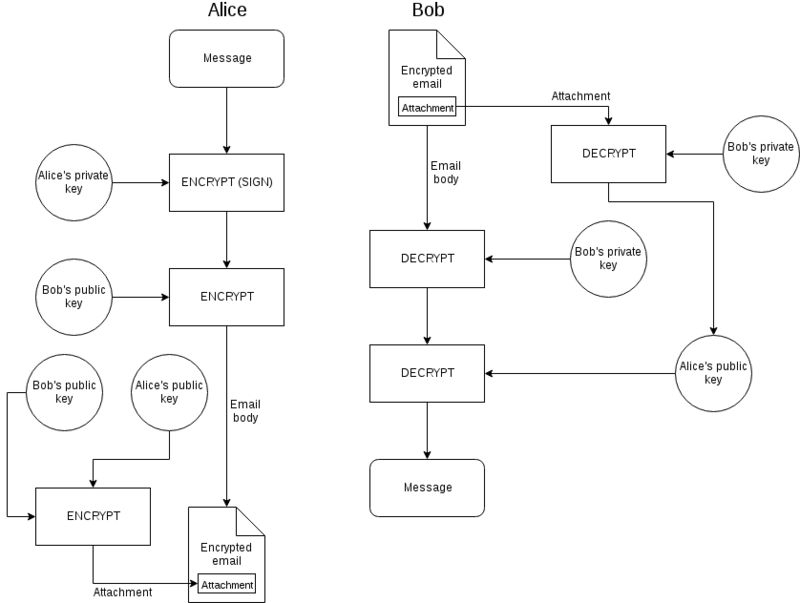 Both diagrams (Figure 1 and 2) showed how PGP is used for the initial (first) contact, meaning Alice had Bob’s public key (which is publicly available), but Bob didn’t have hers. She needed to share her public key with Bob, so she had to securely send it to Bob along with the message. Therefore, Bob can securely receive Alice’s key, but how can Alice know she really has Bob’s key? One of the ways this is solved is that Bob’s key is signed by other parties, ideally ones that both Alice and Bob trust. Key servers show when a key has been signed by another key. In addition to this, you need to know which key to use, as other people can upload keys with the same name and email address to keyservers. Hosting the key on a personal website, or adding the fingerprint to Twitter bio is useful. A fingerprint is all you need to download the key from a keyserver. Once keys are exchanged, either in advance of the communication, or by attaching the public key in an encrypted form to the email (as you can see in Figure 2 — the diagram above), the process is exactly the same as with the initial contact, minus the parts with attachment, as there’s no need to exchange keys anymore.